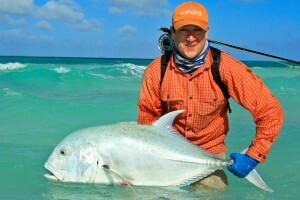 Before I die… which I’m not planning on doing any time soon, I’d like to catch a GT on the fly. I love it when content that is awesome shows up unnanounced in my in-box. That’s what happened on this guest post from Tom Paulson who picked up on my semi-fixation with someday cathing a GT. 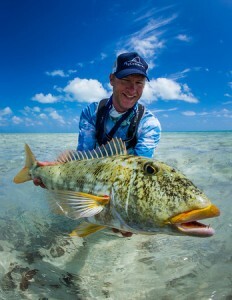 Here is his advice and experience chasing GT’s in Christmas Island. He had not fished for them before, so this is from a GT-Virgin perspective, which is how most of you (and I) would approach it. Good stuff. 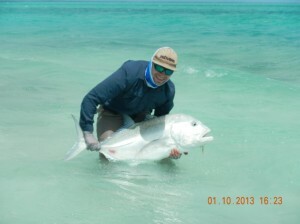 I recently spent 6 days fly fishing in Christmas Island, Kiribati. This was my first trip to Christmas Island (CXI). 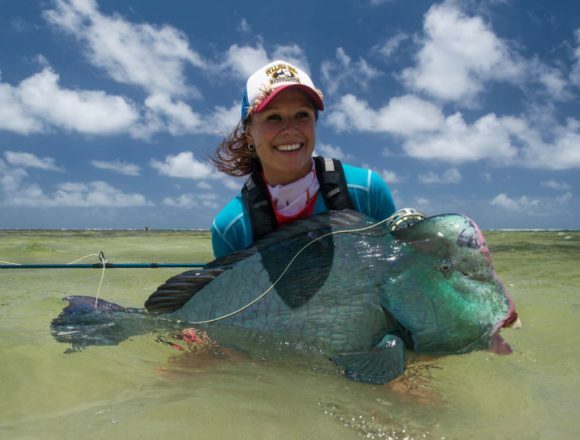 I booked my trip 5 months ahead of time, and spent a lot of that time meticulously planning and learning all I could about the fishery at CXI and the gear necessary to battle the legendary Giant Trevally. I found it difficult to find any real detailed information about gear and setups, so this is my attempt to make a one stop shop for anyone heading to fish for GT’s for the first time. I’m writing this from the perspective of someone who had absolutely no experience with GT’s before this trip. Believe me, I know how overwhelming it can seem. Most places you’ll fish for GT’s are far enough away from civilization, you want to make sure you’ve got your setups and back-ups spot on because once you get there, what you have is what you have. Having the necessary amount of back up equipment is essential, mark my words, these fish are hard on gear. 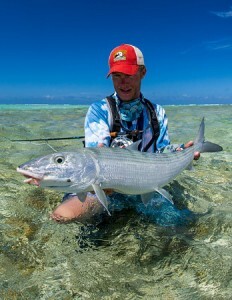 You don’t want to be resigned to watching massive v-wakes come straight at you on the edge of the bonefish flat and have to think ‘gosh, I wish I would have brought back up Trevally stuff’. I also understand that fly-fishing for GT’s is a relatively new thing, my setup may not be the best, but for the most part, it worked for me. This is basically a reflection of what I learned fishing for GT’s. We experienced the GT’s mostly cruising the edge of the flat as the tide was moving. They’ll be looking to ambush fish coming on, or leaving the flats. Most of the time you’ll be bonefishing and see their wake, or a large shadow approaching. It’s important to keep your cool, but to be quick. You’ll want to have your idle GT rod’s drag set so you can strip out enough line for a 30-50ft. and cast ASAP to get the best angle you can on the fish. 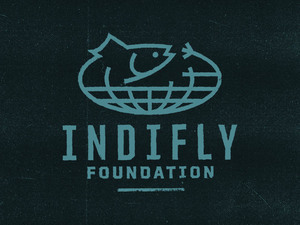 The key is to get that fly roughly within a 10ft. window in front of that cruising fish. If that shows interest start stripping like there’s no tomorrow until you get a take, these fish love to chase. If the fish doesn’t show interest, and doesn’t spook, wait a little while to see if the fish returns. I noticed a few times that GT’s would circle around the same area 2-3 times before moving on. One thing that surprised me on CXI was how selective a solo GT can be when they are in cruise mode. All the videos you’ll see of GT’s is mostly of groups of them going gangbusters after flies. My experience was that they can actually be quite picky. My perception before my trip was that these fish will take just about anything put in front of them, but that just isn’t the case in most situations. I think you’ll have the most success keying in on patterns that emulate milkfish, mullet, and yellow snapper in 3/0-6/0 (at CXI). If you encounter a group however, you’ve got a much better shot of hooking up. In this situation, you could probably cast a boat anchor in front of them and probably get a take. The competition aspect increases their aggressiveness tenfold. It’s really something to see alternating mouths trying to engulf your fly while stripping like a mad man, trying not to wet your pants and wondering whether you’ll get a take before the fly hits the tip of your rod. Everything anyone tells you about GT’s fighting dirty is probably true. It’s a lot different from a long drawn out tarpon fight. The fight isn’t a long one, but it is fast, furious, and nerve wracking. My group as a total for the week was 8/12 (GT’s hooked/GT’s landed). The four lost fish were due to 2 straightened hooks, 1 cut fly line, 1 cut spectra backing (lost fly line). The bottom line about fighting GT’s is, you have to get them turned as soon as possible. Once you hook these fish, you’ll want to lock your drag to the max setting. The further GT’s run the better their opportunity to run the entire capacity of your reel. Also, the further they run, the greater the opportunity they’ll have to find something to wrap you up on. Trust me, these fish will look for any and every opportunity to rub up on or wrap you around a coral head, and if they do it enough, they will break you off. I could feel one fish wrap me 5-6 times before I was finally able to get it free and land it. It’s a strange sensation of nausea and relief when you hear your line come free from a coral head. Once you feel the fish, get a solid strip set. Check your line and make sure you’re going to be able to clear it without wrapping it on your reel seat. 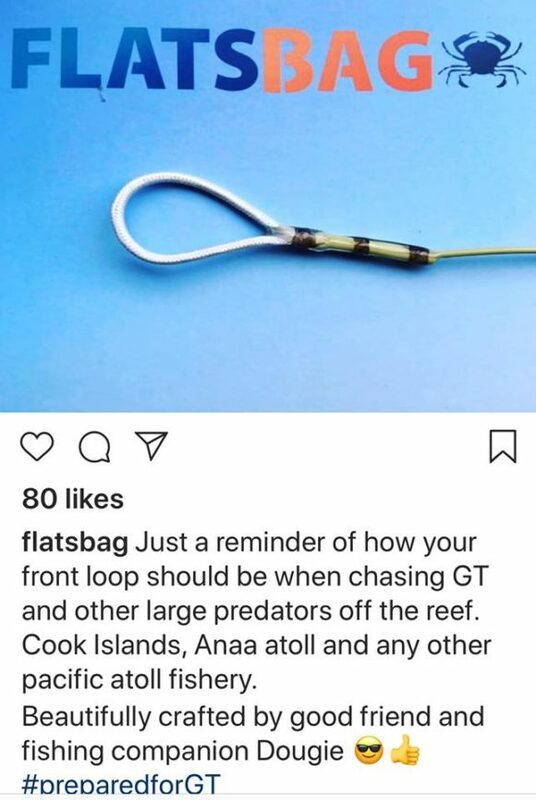 Also make sure it isn’t wrapped around you or any of your gear, and if it is, get ready to do a frantic “Trevally Dance” and hope for the best. Once hooked up, lock your drag down to the max setting. 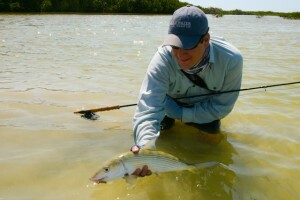 Aim your rod relatively horizontally just above your belt buckle, you want to let the reel do all the work. Any time you feel the fish give you any leeway pump and reel. You will feel these fish start to stall and take little mini runs, they are looking for something to hang you up on. Change your rod angle and start to pump and reel again. Once you’ve got them turned, you probably don’t have to worry about them running your capacity, so take your time and be methodical. If you feel that the fish has got you hung on a coral head, change rod angles, if that doesn’t work, lift your rod (while keeping it somewhat horizontal), if that doesn’t work walk towards or in the direction of your line (if possible) while repeating the steps above. If all else fails, get in a boat. Take care once you get the fish near the flat to keep the fish, and your line away from any obstructions. Keep the GT near the water, take a quick photo and make sure the fish is recovered and released appropriately. I think the rod is probably the least important aspect of your setup, so if you’re looking for a way to save money, in my opinion the rod is the one. For the most part, you’re not going to need to make a cast over 50ft. Nevertheless, the TiCR-x did everything I needed it to. I took a massive risk taking two of these reels to CXI seeing that they are relatively new product and untested. 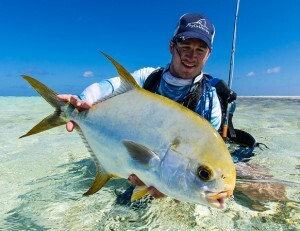 Everyone told me before I left ‘only the absolute best saltwater reels will do for Trevally’. But it’s hard to pass up being able to buy 2 of these reels for the price of 1 reel from one of the Tibor, Nautilus, Hatch variety. Whatever your premonitions are about this company, let me tell you, their reels are legit. 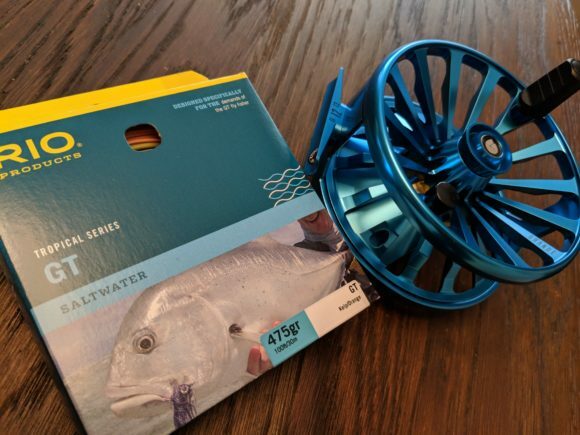 I have had a reel from another company who people perceive to be one of the pinnacles of Saltwater reel manufacturers blow up on a ~125-150# tarpon. A GT in the 50# class will run further, fight harder, and dirtier than most Tarpon in my opinion. Your reel needs to be able to handle nearly its entire capacity being ran at max tension. The purpose of the Dacron is to provide a kind of cushion for the spectra. You’ll be fighting these GT’s @ your max drag setting so there is an incredible amount of tension. It was brought to my attention by a “GT veteran” that straight spectra will dig into itself and can cause you problems when the fish is running. Welded loop reinforced with 2 nail knots with 16# mono or flouro. Airflo 50# core floating GT line. Welded loop to Perfection Loop. Note: I didn’t reinforce this welded loop, but I never had any trouble with just the loop to loop connection on its own. ~6 ft. Straight 100# fluorocarbon. Lefty’s non-slip loop to fly. After my experience at CXI, GT’s for me are the ultimate inshore species. Seeing a 50# GT chase down your fly is the thrill of a lifetime. These fish will test your gear, as well as your heart function. 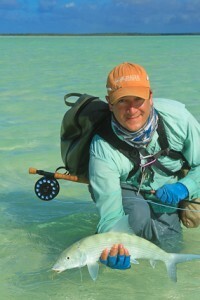 If you are even thinking of knocking out GT’s on your species list, do it. Now. I must say in closing, I’ve been to many places fly fishing. For me, it’s such a thrill to fish new destinations that I rarely feel like I’d want to return to places I’ve been before. CXI is a place I would absolutely return to. There aren’t many other places you can target so many species in one place. Another draw for CXI is that you could probably spend 2 months fishing everyday in the lagoon and not fish the same flat twice. Lastly, you’ll never meet such caring, friendly people, smiling people as you will on CXI. It’s really uplifting to meet people with such amazing outlooks on life, who have practically no material possessions.